Autism Research and Resources of Oregon (ARROAutism) is a non-profit organization dedicated, in part, to developing and maintaining, a center of excellence in Oregon. This future location will provide the Autism community with a place to meet, share ideas, offer support, and provide Autism related services. Financial support for the Center will be derived, in part, from Donations from the community, from corporate sponsors, and through fun filled events like annual Sean’s Run for ARROAutism and An Evening for Autism, as well as events including lectures, panel discussions and more. As part of a new initiative, ARROAutism will also focus new energies on our website, which will soon provide a whole new way to find, and access resources. 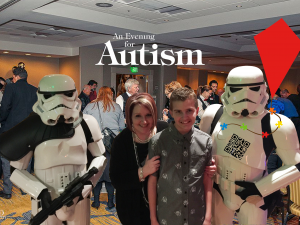 Your contribution today can ensure the continuation of all our projects, and the achievement of ARROAutism’s overarching mission; to produce and promote a center of excellence in the field of Autism research and services in the state of Oregon. Questions? Contact ARROAutism’s Executive Director Kathy Henley at kathyh@arroautism.org, or call (971) 258-2360 . This entry was posted in Featured, Fundraisers, Mission, New!, News and Updates, Westside Family and Community Center. Bookmark the permalink.